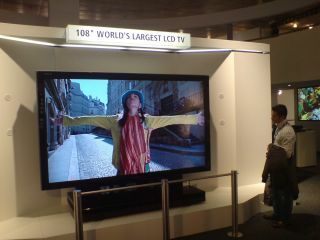 LCD TV pioneer, Sharp , has been showing off its brand new world record-beating 108-inch LCD TV screens here at CeBIT. Announced earlier in the year, the LCD screens are the largest on the planet, and add an additional five inches to Panasonic's 103-inch plasma screen. The 108-inch screens measure 2.73 metres diagonally across, and the Sharp stand in Hannover, Germany has a number of them displaying high definition content. "LCD TVs continue to gain increasing popularity, with demand growing worldwide. By the end of 2006, and for the first time, more LCD TVs than conventional picture tube sets were being sold," said Hans Kleis, CEO of Sharp Electronics Europe. "This year, Sharp is expecting worldwide demand for LCD-TVs of 68 million units, 27 million of these in Europe. "With the 108-inch full HD LCD TV and the technological advances in panel and image quality, we have once again proven our technological and market leadership in an impressive manner, and we have developed a one-of-a kind product that will definitively influence the market. Faithful to the Sharp motto: make products that others want to imitate"
Currently more LCD TVs with diagonal screen measurements of over 37 inches are being sold than comparable plasma units. So Sharp is placing an emphasis on the development of large-format screens. There is no pricing information available yet for Sharp's 108-inch LCD TV but, with Panasonic's 103-inch plasma screen selling for around £50,000, we're likely to see a price tag slightly higher than this. Incidentally the world's biggest high definition TV is the Toshiba 2651, which measures 11.2 metres tall and 66.4 metres wide - that's the size of 1,500 32-inch LCD panels put together. The TV, which can be seen in this video clip from iFilm , cost 3.2 billion yen (£15 million) and was built for a Japanese racecourse.